Can Anyone I.D. 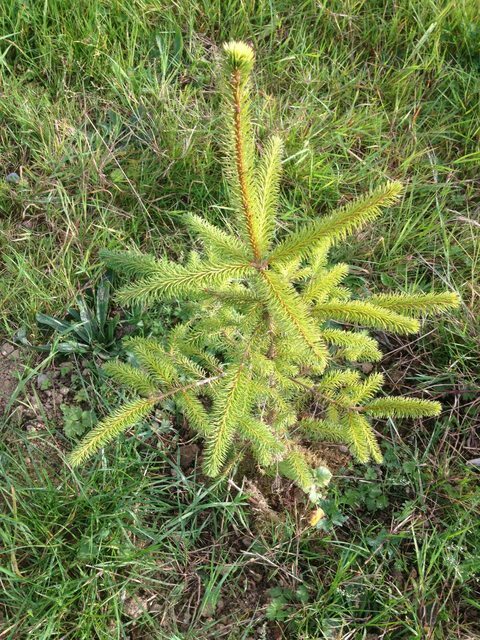 this Evergreen Sapling? Posted: Mon Oct 06, 2014 6:34 pm Post subject: Can Anyone I.D. this Evergreen Sapling? I have a couple of these potted at the moment. I thought they were Scots Pines, and I was hoping to plant them for ornamental purposes. Now I'm having my doubts. Have you any idea what they are growing up to be? I'm not good at identifying conifers, especially when they are small. However, I would counsel against planting scots pine unless you have a LOT of space. They grow surprisingly quickly into BIG trees and their needles block gutters, drains etc very effectively. I write from bitter experience as I had to fell one I planted on my boundary - I love them as trees, but at least 100 metres from a house! Scots Pine needles are paired and are very long, 25 - 30mm at least. Sitka spruce grow big, too. They can grow up to 100m! Too big for a garden.